Elves are out in Albion businesses, handing out money-saving coupons and Christmas Bucks. 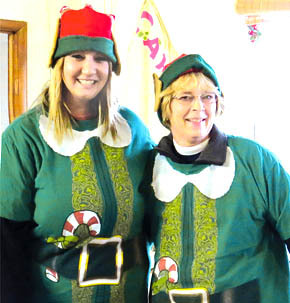 Christi Spiegel and Barb Krohn (above) served as elves during the Albion Chamber of Commerce Customerr Appreciation Day event last Thursday, Nov. 21. More elves will be appearing in Albion businesses during the Christmas season “Get Elfed in Albion” promotion.